Have you seen the new Microsoft ads? The first one of the nearly $300 million campaign featuring Jerry Seinfeld aired last night (I caught it somewhere in one of the Daily Show’s commercial breaks). 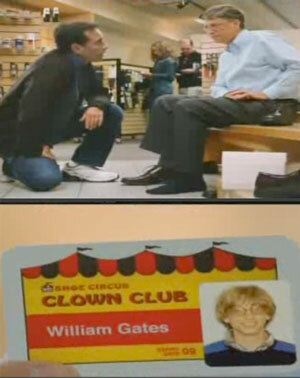 Jerry helps Bill Gates buy a pair of shoes. They mention Microsoft one time. That’s all that happens. The whole thing seems like they’re trying to be funny, but it was decidedly not. No matter how hard Jerry tries, he can’t make the ultimate nerd, Bill Gates, seem anything other than embarrassingly quirky and introverted. The first phase of this campaign is designed to engage consumers and spark a new conversation about Windows – a conversation that will evolve as the campaign progresses, but will always be marked by humor and humanity. So far the conversation my girlfriend and I have had on the subject was, ‘My god that sucked.’ But we talked about it right? I guess their plan is working. I don’t think that’s their actual copy, but that’s the idea. Win the hearts and minds of millions by convincing them that the best you have to offer is not nearly as bad as they thought it was. It’s kind of like the platform the Republicans are running on. My response to all of this? Get a Mac. This entry was posted on Friday, September 5th, 2008 at 10:35 am	and is filed under 'Puters, Rants and Raves. You can follow any responses to this entry through the RSS 2.0 feed. You can leave a response, or trackback from your own site.